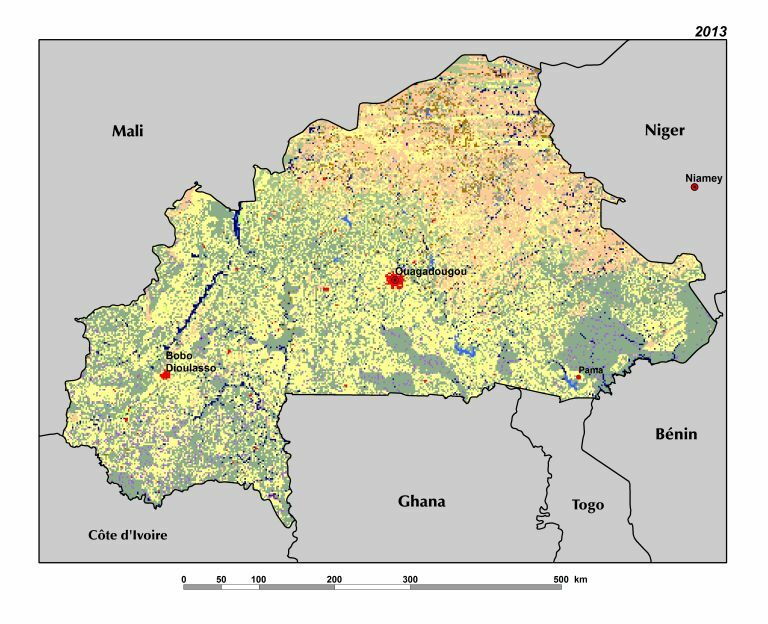 The most obvious change in Burkina Faso’s land cover is the major expansion of croplands. In 1975, when the population was just over 6.1 million, savannas were still the dominant landscape. Even then, agricultural development was beginning to fragment the wooded savannas in central areas of the country. Agricultural expansion started along themain roadways. Similarly, agriculture was increasing along the Ouagadougou-Pama corridor in the southeast, and small isolated patches of cropland were appearing among extensive natural areas. However, a large portion of the country’s southern ecoregions remained relatively untouched. The majority of protected areas could not yet be distinguished from the surrounding natural savanna landscapes. 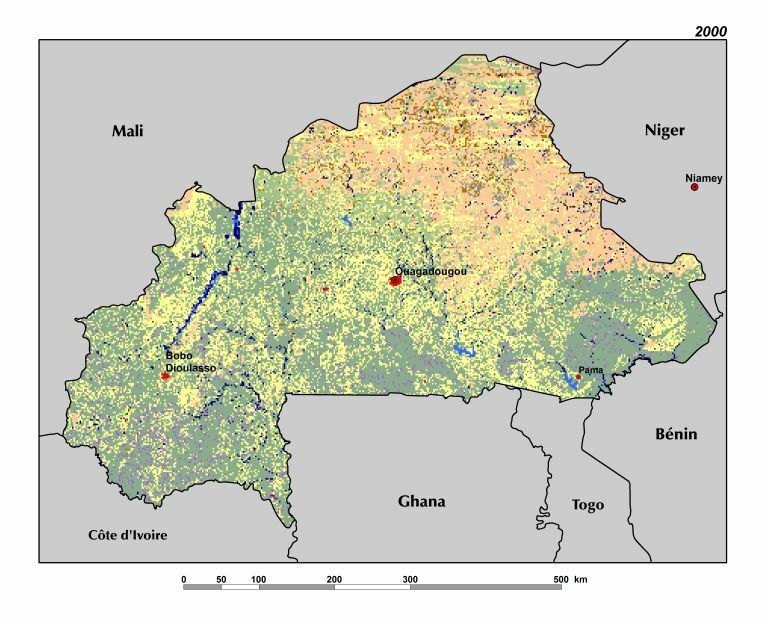 In 2013, the population of Burkina Faso reached 17 million and changes in land cover shown by the maps are striking. Burkina Faso’s natural landscapes have been rapidly altered by human activity. Conversion into croplands represents a major transformation, leaving few remnants of the former vegetation structure and diversity. In the north, steppe areas have remained fairly stable because this land cover class occurs in the more arid Sahel, where more marginal soils and lower rainfall severely limit crop cultivation. In 1975, 82.5 percent of Burkina Faso’s land was still covered by natural land cover classes (forest, gallery forest, savanna, steppe, or rocky land). In 2013, only 57.4 percent of the country’s land was occupied by these land cover classes. Between 1975 and 2013, savannas (Sahelian and Sudanian) shrank by 39 percent. The country’s land area covered by rainfed agriculture increased from only 15 percent in 1975 to 39 percent in 2013, an overall increase of 160 percent. This agricultural expansion exceeds 4 percent per year on average, which corresponds to 1,720 sq km of cropland added each year. Agricultural areas increased only slightly in the north and central plateau, where unfavorable rainfall and rocky soils have kept agricultural expansion to a minimum, but the other two-thirds of the country has experienced considerable agricultural development. Tree and wooded savannas and the gallery forests of the Sudanian zone have been heavily altered to make room for rainfed crops. 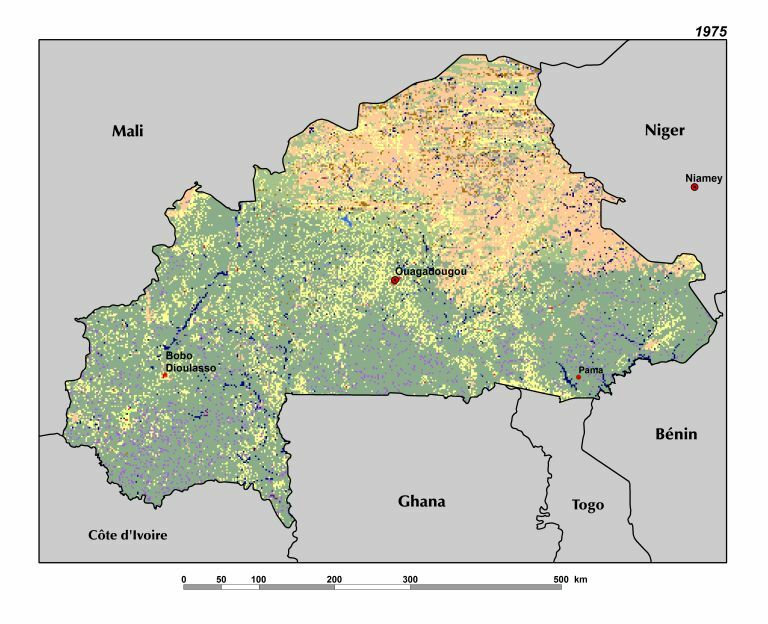 The progression of croplands across Burkina Faso during the last four decades has replaced natural landscapes with crop fields and fallows. The only natural landscapes of significant size are restricted to protected areas, and these now stand in sharp contrast against the dominant surrounding agricultural landscape. In 2013, Burkina Faso ranked second in West Africa behind Nigeria as the most agricultural country (in percent of land covered by crops). Burkina Faso is close to reaching the point where human-shaped landscapes cover over half of the country. It seems possible that, in the near future, savannas, woodlands,and forests may only exist in isolated, protected areas that will no longer be connected by natural corridors. Another critical land cover class is gallery forest. Gallery forests are easily spotted because they stand out from the surrounding savanna vegetation. Although gallery forests are limited to a narrow strip of dense tree cover along streams, their overall area widely exceeds the few remnants of forest (only 48 sq km in 2013). In 1975, gallery forest occupied 7,000 sq km, or about 2.6 percent of the Burkinabe land area. Agricultural expansion decreased this to about 5,000 sq km in 2013, which corresponds to a 30 percent reduction within 38 years. Gallery forests host a wide variety of plant and animal species, making them a conservation priority.